Each bag of Faraon Crackers has four inner bags for convenience and maximum preservation of freshness. No sugar added. 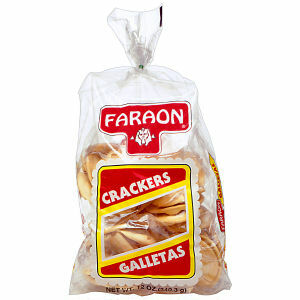 Faraon crackers are also called "Cuban crackers" because that is where they originated. They are great for using as an appetizer or snack when combined with cheese, ham or any other meat. Also popular when combined with guava paste or any sweet marmalade. Faraon Crackers are so delicious you might just prefer to eat them all by themselves! Quality and freshness guaranteed.